Studying with a developer, Yale architecture students get a workouttand a jump on the job market. Alec Appelbaum sits in on the crits. Four pin-ups in four days sounds like the architectural-school analogue to a fraternity’s hell week. Yet ten Yale School of Architecture graduates who ran that gauntlet in their last semester say they’re healthier for it. One became a smoother presenter. Another learned to detail projects more thoroughly. A third got a job. They carry these trophies from the first-ever Bass Fellowship, in which a client sits alongside an architect to critique student work. Robert A. M. Stern, Yale’s dean, expects the two-headed critiques to produce sharper architects. The graduates of the first round feel sharper, if more tired. The course aimed to show students that architects must master many disciplines to produce real and memorable buildings. In law school you have moot court,, said Stern. Why should architecture schools be insulated?? The first Bass fellow, developer Gerald Hines, has been a patron of Philip Johnson and other audacious designers. He and co-critic Jay Wyper, who heads Hines’ European operations, shattered stereotypes of clients as Armani-clad reptiles. Instead, they established the client as a legitimate voice whose concerns about a building’s usability overruled students’ thoughts about a building’s beauty. Learning to wrap architectural ideas in practical terms, students applied economic measures to steep ambitions. Ben Albertson and Marissa Brown used this aerial view to urge the developers to consider lifting the whole piazza to encourage circulation. Hines and his deputies warned students that inflexible local regulations often force architects to squeeze ingenuity into narrow constraints. That voice gained urgency because Hines presented a real project for which real contractors await real drawings. Hines needs an iconicc fashion museum and school in Milan’s Piazza Garibaldi, for which Cesar Pelli has just finished a master plan. The developers urged students to concoct eye-popping designs that wouldn’t stymie engineers or upbraid regulators. Students refined their projects through rapid-response assessment. The weeks when we had four pin-ups were very difficult, but that was when we learned the most,, said Genevieve Fu, who’s joining Dublin-based architecture firm Hennigan.Peng after the summer. Her report validates Stern’s plan: Students felt like pinballs in a machine,, he said, but that’s how buildings get designed and built..
Students also could never predict who’d eyeball their work. Hines and lead architect-critic Stefan Behnisch missed many sessions, and superstars like Pelli and Greg Lynn joined a midterm jury. Smooth-tempered Manhattan architect Markus Dochantschi served as fulltime critic, helping students throughout the course, synthesizing critics’ comments. With a draftsman’s efficient movements, Dochantschi rooted on students’ ambitions while reinforcing critics’ priorities. He raved to a reporter about one team’s proposal to dig up the piazza for an elevated tower, but didn’t interfere when Wyper questioned the ideas’ economics. The true education came through trial by fire,, said Ben Albertson, who proposed the idea. It became apparent that the more concrete our ideas were, the easier they were to sell..
Students sometimes described this lesson as a leash. Their designs showed as much theoretical purism as anything Zaha Hadid never built. Albertson and Marissa Brown argued doggedly for moving the building complex onto higher ground, to encourage more pedestrian traffic. Ceren Bingol pressed to rearrange the entire site in order to promote 24-hour street life. Wyper repeatedly reminded students during the midterm review that the master plan lay outside their writ. But students sacrifice mental enrichment when they lock onto uncontroversial plans. So their work stayed more abstract than what competitive firms might submit. Their descriptions of the work, though, gained professional sheen. 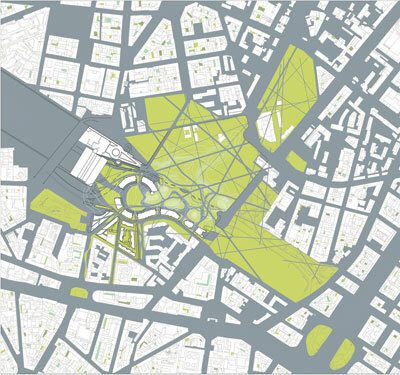 Thinking about developers’ quantitative rigor led Bass Fellowship students to try mapping how people might use Hines’ proposed project for the Piazza Garibaldi in Milan. 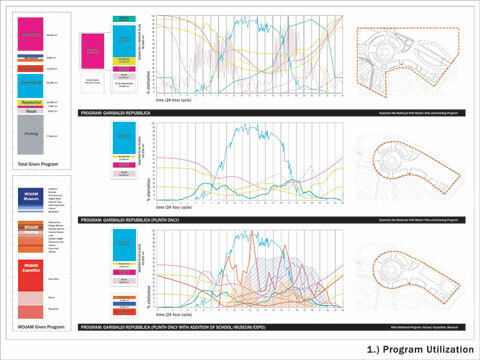 Albertson and Brown chart how popular the project’s componentssmuseum, school, park, and commercial spaceecan be at different times of day. A Hines rep urged teams to design contextually striking buildings rather than reconfiguring the context. Click on the image to open full size chart (PDF). Indeed, Fu credits the critics with making her a more comfortable presenterrand a more marketable architect. I learned to really enjoy presentation,, said Fu. When I was interviewing, [a partner at a firm] said, You seem to like to talk.’ It was life-changing in that way.. Dochantschi, who ran Hadid’s office in London, says the course’s gifts will pay off promptly in the job market. What is incredible for students is they got to think, How can I be more secure and educated about having a productive conversation with a developer?? he said. Had they not had this experience, it could have taken them years.. Yet the 13-week sprint’s shifting cast of reviewers left students weary. I don’t think working with Wyper and Hines added that much to our experience with clients, because we saw them four times,, said Bingol. She said she gained more enrichment in conversation on field trips to Milan and New York than through pedagogy in New Haven. To be sure, students discovered the importance of consulting with clients as often and clearly as a project requires. But they didn’t necessarily codify robust principles to make those consultations efficient. Wyper wished the course had built a straightforward rationale of client-focused building design. There should be more early classes with developers to discuss the balance of design and commerce,, he said. For our semester, this was done more through discussions and critiques, and I think the osmosis was varied and not optimal..
Ceren Bingol saw Gerald Hines’ proposed projectta complex housing a fashion museum and a school in a glum MIlan piazzaaas a way to promote 24-hour street life. She also answered Hines’ call for an iconic building, but challenged the edict that her icon had to fit a master plan Hines had already commissioned, from Cesar Pelli. Dochschanti and Stern enthuse about the Bass Fellowship’s potential to establish a common language. They hope its graduates will affirm that sound designs lead to logical, efficient buildingssespecially in the highly regulated and ecologically sensitive cities where major projects occur. Working with a developer as client is relatively new,, Stern said. The complexity of urban settings is relatively new. We have to arm our students.. Students seem mainly to have learned how to translate aesthetic choices into practical terms. That’s a crucial skill, but it falls shy of the evolutionary leap Stern seemed to seek. If the course’s two lead critics work in tighter sync, Fu suggested, the theoretical discussions Wyper endorses may engage more students. Behnisch and Hines scarcely knew each other when the semester started. Next year’s fellows will be Lord Richard Rogers and developer Stuart Lipton, along with engineer Chris Wise. All three have worked together in London. The tighter coordination between architect and client might erode the disciplinary divide. For now, that divide remains as beholden to financial reality in New Haven as it does elsewhere. Jonah Gamblin and his partner, Forth Bagley, won the school’s top honor for ingenuity with their museum proposal. Yet Gamblin said professors rebuked his decision to go work for Hines’ finance office. A lot of architects have to do their own development to get work,, Gamblin reasoned. I don’t know where they learn those skills.. To supply students with professional acumen, the Bass studio may have to explain why clients’ demands can be as rewarding as they are exhausting. ALEC APPELBAUM writes about the urban environment for time out NEW YORK, METROPOLIS, AND OTHER PUBLICATIONS. Architect: Renzo Piano Building WorkshoppRenzo Piano, principal; Bernard Plattner, principal; Erik Volz, associate; Serge Drouin, designer. Fox & Fowle ArchitectssBruce Fowle, principal; Daniel Kaplan, principal; Gerald Rosenfeld, project manager, Fox & Fowle. Associate architect: Gensler Architecture, interiors. Consultant(s): Landscape: H.M. White Site Architects, landscape; Office for Visual Interaction, lighting; Susan Brady Lighting, interior Lighting; Cerami & Associates, acoustics; Pentagram, graphics; Jenkins & Huntington, elevator; Heitmann & Associates, exterior wall; Kroll Worldwide, security; Walsh Lowe, tel./data.